Disclosure: I thankfully was given the opportunity to review Life is ____. : God's Illogical Love Will Change Your Existence by Judah Smith for free from Family Christian. Provided I give an honest review. Hello Loverlies! Life is _____. 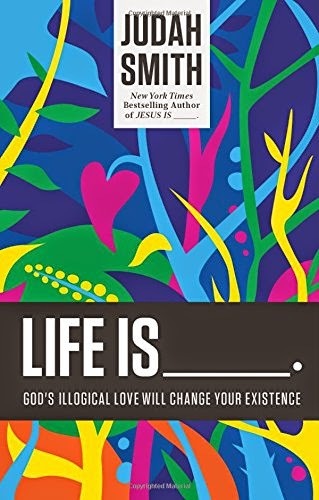 : God's Illogical Love Will Change Your Existence written by Judah Smith I believe is a great book! He has a way of keeping you interested, and he has even put some fun quotes. One of my favorites is the Mawage quote from The Princess Bride. He talks about Lazarus, Mary, Hosea and Gomer, the Disciples, and most of all Jesus. He also incorporates some of his life stories and does a great job at the points he is trying to make with telling them. The point is Life is Jesus, Life is God. We should fill our whole life with Jesus' teachings, and Surround our thoughts and lives with God. One thing We should attempt is to strive our best to do as Jesus did here on earth. No one is perfect and it is hard for us not to sin, because we are human. But I think as long as we are trying our hardest to do this, it will please God. We should not discriminate someone because of their choices, and ways they live. God doesn't because he loves us. My thoughts are if you push people away because they do not act or believe as you do, how else are you going to be able to witness to them? Just being there for them and being a great friend to them, that is also witnessing to people. They will see you have something different in you, and how that difference is God. This is what I got from this book, and it is an amazing reminder of how we should be. I really enjoyed this book and see myself rereading it a lot in the future. I think it would be well worth a purchase! Have A Blessed Day! - Life is to be loved and to love. - Life is to trust God in every moment. - Life is to be at peace with God and yourself. - Life is to enjoy God. Judah writes as a friend, welcoming new believers, lifelong followers of Jesus, and even the merely curious. He shows us the love of God that defies human logic and the life that God intends for us to have in the here and now. With excitement and humor, Judah looks at the stories in the Bible from his unique angle and shows how life is all about loving God and loving others. I would love to pin this but it doesn't have any images to go with it on Pinterest.